NVIDIA leverages Automated Insights’ natural language generation (NLG) platform, Wordsmith, to augment marketing analytics directly inside their Tableau dashboards. NVIDIA revolutionized the PC gaming market with the invention of the GPU back in 1999. It started out as an engine for simulating human imagination, conjuring up the amazing virtual worlds of videogames and Hollywood films. Today, NVIDIA’s GPU simulates human intelligence, running deep learning algorithms and acting as the brain of computers, robots, and self-driving cars that can perceive and understand the world. Tableau Software helps people see and understand data. Tableau helps anyone quickly analyze, visualize and share information. More than 57,000 customer accounts get rapid results with Tableau in the office and on-the-go. Over 300,000 people use Tableau Public to share data in their blogs and websites. The NVIDIA marketing team relies on up-to-the-minute data and Tableau dashboards to make fast-paced, data-driven decisions. It was essential to NVIDIA that everyone be armed with the tools to confidently make rapid business decisions. There was no time to spare, so deciphering the data and creating manual reports with meaningful insights and recommendations was out of the question. Everyone needed to be on the same page, so ensuring that there were no disparities in data analysis was an essential facet of enabling every member of the team. 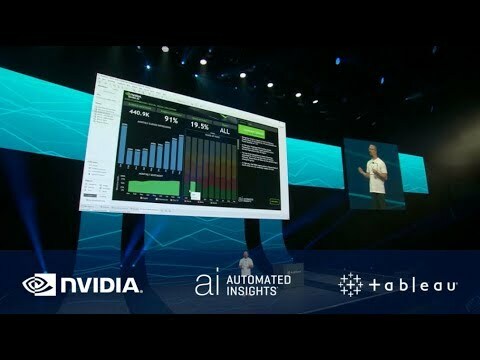 NVIDIA reached out to Automated Insights (Ai) to help add context to their Tableau dashboards, making them more consumable and empowering the team to move faster. Utilizing Ai’s Wordsmith NLG platform, NVIDIA was able to provide their team with an automated data expert, telling them exactly what they need to know about the data in an easy to digest way, the written word. Using Wordsmith, NVIDIA receives comprehensive, real-time summaries within their Tableau dashboards which automatically updates as NVIDIA team members explore and filter their visualizations. In conjunction with the release of Tableau’s new Extensions API, Automated Insights has produced the first instance of NLG delivered directly within a Tableau dashboard. Automated Insights’ Wordsmith allows me to scale my team. It’s like having an expert data analyst guide us through our data, allowing us to make better and faster decisions. Producing millions of weekly—completely unique—fantasy football reports.